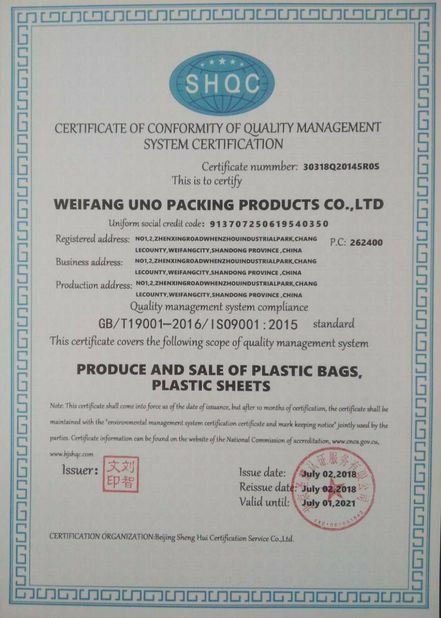 Weifang UNO Packing Products Co., Ltd is a production, import and export, domestic trade as one of the comprehensive modernization of enterprises. 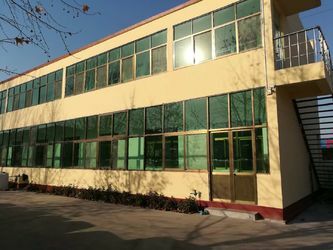 Founded in 2009, located in Weifang City, Shandong Province, with more than 8000 square meters modern standard factory buildings, more than 50 sets of production equipment. Mainly engaged in various types of printing and non-printing, high and low pressure polyethylene bags,Plastic tableware and so on . 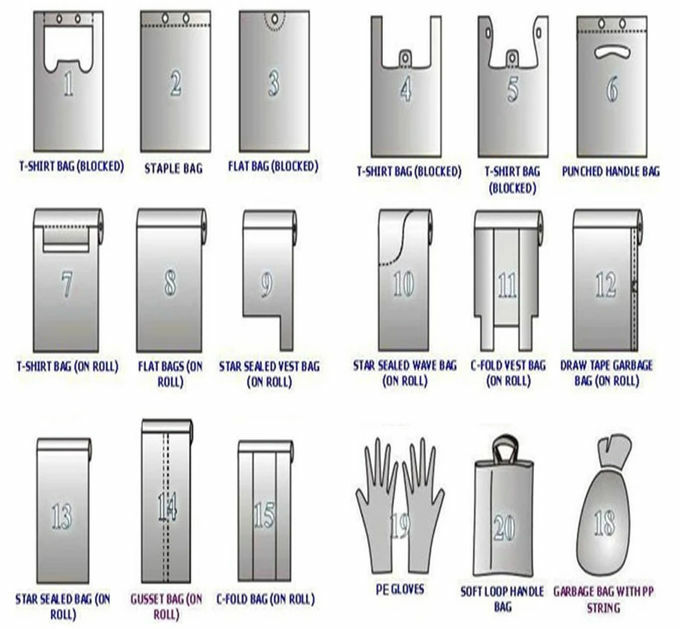 Major product categories are: LDPE/HDPE/PVC/PP/PE Glove, Ziplock, Apron, Slipcover, Mattress cover, Car cover, Garbage bags, Food bags, Handbags, Gift bags, Clothing bags, Vest bags, PVC bags, Flat bags, OPP Sheet, preservative film Plastic tableware. 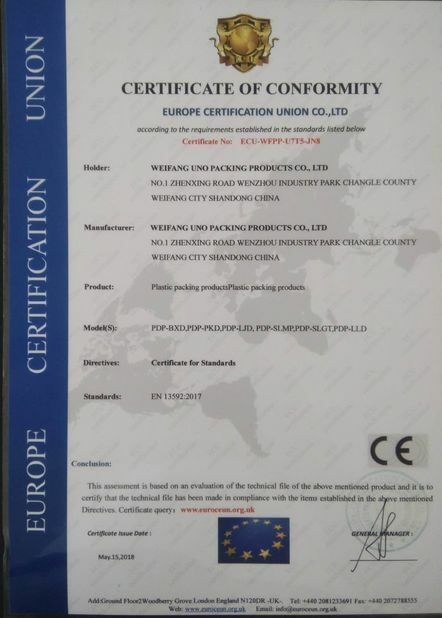 Since the establishment of our company, engaged in the development and production of various types of plastic bags.Our production has been exported to Eastern Europe, Western Europe, Latin America, North America, West Africa and other regions.Our products has been praised by the customers from US, Germany, France, the Netherlands Spain, Romania, Brazil and other countries. Our excellent product quality, competitive price and perfect after-sales service, the constant pursuit of excellence in attitude, has been recognized by the customers all at home and abroad. Division I sought through accurate grasp of the industry, not to avoid direct competition to provide customers with competitive products. 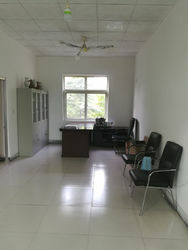 At the same time, our company continue to provide better quality service , honest to be human, honest to do business, to welcome all friends to visit, business negotiations, we would like to cooperate with you to create a better future. 2009: Bought 6 lines of bag making machine. To expand the business, and at that time we can make many different kind of plastic bags. And 6 sets of Film blowing machine. 2010: Bought 4 sets of the blowing machine, especially produce the high quality food grade packaging films. 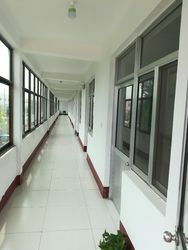 We have improved our quality in a high level. 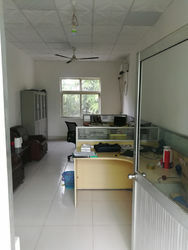 2011: Based on our bigger and bigger business, we bought a place to bulid a high buliding for our office and prooduction factory. 5000㎡ square. 5 floor buliding. And also a 1000㎡ for stock raw material. Main Business: Plastic packaging bags. Heavy duty plastic bags Plastic garbage bags. 2013: Start the business of international trade. 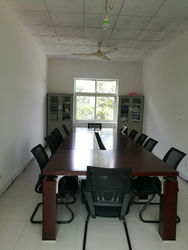 We gathering different country customers, and Cultivate a stable trade relationships with each other. 2014: Based on so many years collection, we are becoming bigger and bigger. 2015: Import a High quality HDPE film blowing machine from Dalian, In order to Improve us in a higher level. We have become competitive in the film blowing field. Our busines has become better and better. Also, We have import the Printing machine, Now we can do the customer printed bags by ourself. We believe can earn more business and get more orders! We are also grateful for our customers so many years suport us! UNO PACKING give professional suggestion and technical support. Now we exported to world markets about 80%, mainly America, Europe, Australia, Middle East and Asia. Certified supplier for Colleges, Chinese government, Chinese military industries. UNO PACKING according Rigid production plan, procedure, detailed steps. In order to give you qualified certificated products! UNO PACKING strictly abides by the quality standards in the process of raw material procurement, machining accuracy assurance, process control on assembling quality, performance testing for the complete machine, and simulated production test so as to ensure that no product is put into the market until it completely meets the design requirements. More and more innovative concepts come out of their rich experience and excellent skills. Also, with the skillful and advanced production technology, various perfect products are coming into being.